46 5BR | 6.5BA | 6,910 SQ FT $4,250,000 | MLS# 5511836 Libby Cohen 602.291.1446 5BR | 5.5BA | 7,767 SQ FT $3,695,000 | MLS# 5565042 Karen Ganz 602.469.6709 5BR | 7BA | 9,430 SQ FT $3,850,000 | MLS# 5494232 Libby Cohen 602.291.1446 ENCHANTING ARCADIA 4835 East Exeter Boulevard, Phoenix For the first time on the market, this iconic estate property on Exeter Boulevard in beautiful Arcadia is absolutely enchanting. The timelessly elegant Mediterranean style architecture of the main house makes for a stunning silhouette against two and a half acres of lush and unique landscaping. Fountains, water features, and secluded patios and ramadas as well as a separate guesthouse and a separate pool house, create interest throughout the fully walled and gated property. Inside you will find lovely Brazilian cherry hardwood flooring and custom cabinetry. The first floor is comprised of a gracious living room, formal dining room, spacious kitchen and breakfast room, a wood-paneled den and bar, an exercise room with sauna, and three generously sized en-suite bedrooms. Stunning views are enjoyed from the upstairs balconies, including a grand balcony off the master suite which includes a wood-burning fireplace. 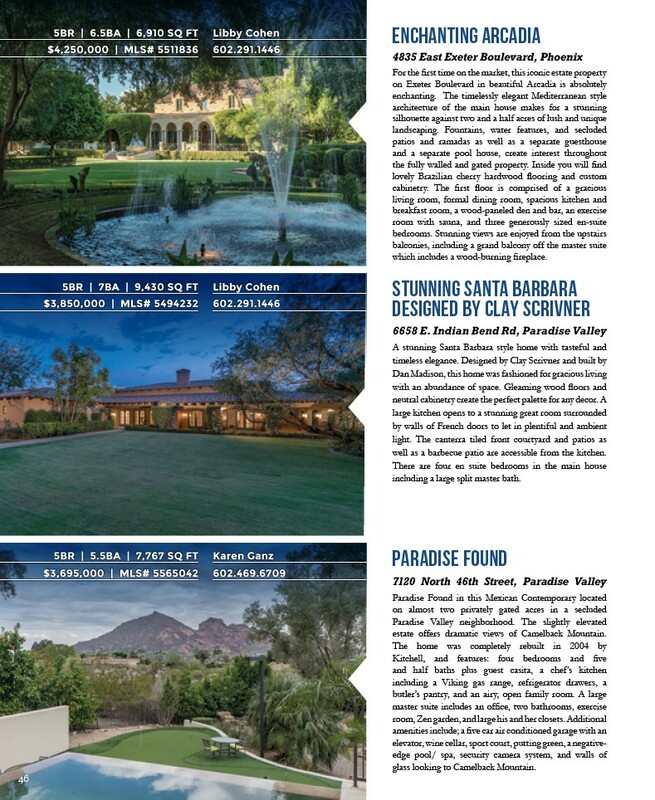 STUNNING SANTA BARBARA DESIGNED BY CLAY SCRIVNER 6658 E. Indian Bend Rd, Paradise Valley A stunning Santa Barbara style home with tasteful and timeless elegance. Designed by Clay Scrivner and built by Dan Madison, this home was fashioned for gracious living with an abundance of space. Gleaming wood floors and neutral cabinetry create the perfect palette for any decor. A large kitchen opens to a stunning great room surrounded by walls of French doors to let in plentiful and ambient light. The canterra tiled front courtyard and patios as well as a barbecue patio are accessible from the kitchen. There are four en suite bedrooms in the main house including a large split master bath. PARADISE FOUND 7120 North 46th Street, Paradise Valley Paradise Found in this Mexican Contemporary located on almost two privately gated acres in a secluded Paradise Valley neighborhood. The slightly elevated estate offers dramatic views of Camelback Mountain. The home was completely rebuilt in 2004 by Kitchell, and features: four bedrooms and five and half baths plus guest casita, a chef’s kitchen including a Viking gas range, refrigerator drawers, a butler’s pantry, and an airy, open family room. A large master suite includes an office, two bathrooms, exercise room, Zen garden, and large his and her closets. Additional amenities include; a five car air conditioned garage with an elevator, wine cellar, sport court, putting green, a negativeedge pool/ spa, security camera system, and walls of glass looking to Camelback Mountain.